Former Ethics and Entegrity minister Miria Matembe wants term limits reinstated. Courtesy photo. KAMPALA–After 11 years, the former minister for Ethic and integrity Miria Matembe has gone to the Constitutional Court, challenging the lifting of the Presidential term limit. 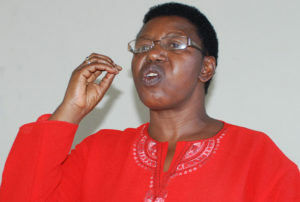 Matembe, also a former legislator, who strongly opposed the Presidential term limit to the extent of losing her ministerial position in 2004, now wants court to reinstate the term limit. She has dragged the Attorney General and Parliament. The term limit was lifted in 2005, with some analysts accusing President Museveni of bribing some MPs with Shs5 million to lift the term limit. Matembe’s legal move comes at a time when Parliament is at crossroads over amending Article 102 (b) of the Constitution to allow President Museveni run for Presidency after clocking 75 years. Some NRM legislators, who are the majority, sat last week to discuss how to table the lift the Presidential age limit in Parliament. Their rivals, the opposition legislators, vowed to block it, arguing that the move aims at entrenching President Museveni in power. The matter is becoming contentious with religious leaders, demanding that the Electoral Commission should organize a referendum, so that the public decides on the matter. Workers MP Dr. Sam Lyomoki yesterday wrote to the Speaker of Parliament, Rebecca Kadaga, asking her to allow him move a motion to discuss Museveni’s succession, transition and his immunities. Last week, Lyomoki told PML Daily that any person who has clocked 75 years and above is not fit medically to be a leader. Ibrahim Kasozi, Makindye East legislator, backed Lyomoki , arguing that as legislators, they should be debating on the post Uganda museveni for the betterment of his few achievements, next generation. “We should leave our Constitution intact and it stands a test of time because it is still in its infancy stages at 22 years only,” Kasozi argues. The deputy Speaker Jacob Oulayah adjourned Thursday’s meeting to Tuesday next week, after the opposition MPs made it difficult for lifting age limit matter to be tabled. Kasozi alleges that yesterday, he was been reliably informed by an insider in the corridors of power that the state has earmarked a whopping Shs78b for both the ruling party’s legislators and a few opposition legislators, to amend Article 102(b). “As an outstanding legislator, I would like to call upon my fellow colleagues from the NRM side to think twice before supporting this vague and outragious age limit,” Kasozi advised. He applauded famous joint campaign by the opposition dubbed ‘ Tojjikwatako’ led by leaders of all political parties, withstanding intimidation. On Thursday, the Lord Mayor Erias Lukwago, Dr. Kizza Besigye, the former FDC presidential candidate and many KCCA councilors were arrested, detained at different Police stations, accusing them of planning to engage in illegal assemblies. Police released many of them and promised to arrested those who mishandled Lukwago.